Does anyone have one of these? I used to have one, but when I moved a few years ago, I used that opportunity to throw away a lot of stuff I deemed to be unnecessary junk and clutter. Since the FastTake meter was replaced by the One Touch Ultra series of meters, I assumed it was a relic that had no further use. But now I am wondering about whether that may have been a hasty decision. For those of you who don't remember it, the One Touch FastTake meter was the company's first electronic test strip blood glucose meter (prior to its introduction, all of Johnson & Johnson's meters were the traditional reflective strips that were not only much slower, but also required significantly more blood). FastTake was introduced in the mid-1990's, and the meter itself was identical in size and shape to today's Ultra, the only difference in design was that it was light blue as opposed to navy blue in color. However, the FastTake meter was calibrated to serum glucose rather than whole blood, so users of meters that were calibrated to whole blood had to make an adjustment in their analysis of blood sugar readings when converting to the FastTake meter. Being a new product junkie, I quickly adopted the FastTake as my primary meter, as it was fast (readings were delivered in 15 seconds) and used much less blood, so what was not to like? The test strips were marginally thicker than today's One Touch Ultra strips (presumably, also more expensive to manufacture), and while the meter had a memory, it lacked a data port, which made data the largely inaccessible except via the cumbersome process of writing the numbers and times down. 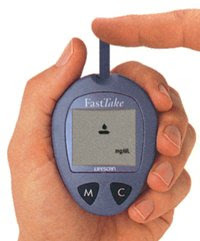 A few years after the introduction, LifeScan introduced a special adapter known as the FastTake Adapter that fit into the slot where the test strips go, and made it possible to download all of the readings into the company's proprietary diabetes management software (it did, however, require the purchase of a ridiculously overpriced cable that fit into a computer's serial port ... LifeScan should consider a USB version, but alas they are behind the times). Personally, I am a big fan of small diabetes supplies, including insulin pens (which, for those of us who have tried pumping, and returned to multiple daily injections (MDI), make it far more portable) as well as even smaller meters. As most of my readers understand, lugging all this crap around is a royal pain, and since most men don't carry around purses, it poses special challenges for guys that women can get away with. Women can toss the stuff into a purse, whereas guys have more trouble since not only do people stare more, but the choice in bags is also much more limited. I've settled on a messenger bag, which typically only becomes available during the fall back-to-school season, and since my old one was looking pretty ragged, I just went to H&M around the corner from where I live and bought 4 new ones so I didn't need to wait another year to have a backup. L.L. Bean also has a nice one (see here for details) which is a bit pricier, but comes with the company's lifetime guarantee that the zippers won't break or they'll replace it for you. Anyway, the topic of small sized diabetes supplies is a relatively new consideration for the product developers at these companies, and in fact, it was only recently that Johnson & Johnson introduced its One Touch Ultra Mini meter, plus, it comes with a smaller lancing device, too. But similar to the FastTake, I am hearing complaints that the Ultra Mini, which can store up to 50 readings, does not have data download capability, which makes me wonder if anyone out there in the blogosphere has a FastTake adapter and can try it out on a One Touch Ultra Mini? I'm not overly technical, but it seems like it could work in a similar manner. But since I can't find my old FastTake adapter, nor could I find a used FastTake adapter anywhere on eBay yesterday, I thought perhaps someone out there in the diabetes blogosphere might have one laying in a drawer and would be willing to try it out (or send it to me to try out)? Please let me know if you do! I will admit that I tried calling the technical service number (1-800-382-7226) and waited on hold for almost an hour yesterday so I could ask them my question, only to get a voice mail! I was a little annoyed, but perhaps someone from LifeScan's public relations department could address this question for me. I just recently came across my old FastTake meter, and for some reason resisted the urge to throw it out. Unfortunately, I never had the adapter, nor do I have an Ultra Mini. But I agree, to me the inability to download readings is a deal breaker on the Mini, even though I'm a long-time Lifescan user. Also, I totally hear you about size of equipment (see my post on pockets). I actually liked the Bayer Dex meter when it first came out because it had strips in the meter. But then it broke on me (probably from carrying it in my pocket 7 days/week), and the Dex2 wasn't as compact. I don't understand why companies make their products worse rather than better. And (finally), in terms of backpacks, I'm a HUGE fan of L.L. Bean, and their continental rucksack, in particular. I didn't realize the mini only held 50 readings (who doesn't read the meter literature?). That's less than five days for O. Good to know - it will spur me to keep on top of logging. I don't like the mini. O loves it, though, so I put up with it. I have both, a One Touch Mini . . . and . . . a Fast Take Adapter. The Fast Take adapter does NOT fit with the One Touch Mini. Translation . . . one cannot use it to download any data from the Mini. Thanks SlideRule, that answers one question that I wondered about! I appreciate your comment and feedback. I'm a bit of a gear guy and log all my blood sugars into my palm pilot to upload to my computer later that week - reduces the need of plugging my meter into my computer. Thanks for the anniversary wishes and the same back at you. I'd wondered if I should post about it next week as I haven't blogged much of late, but you've inspired me to do so. And nice memory lane flashbacks for those Fresca and Tab logos. I definitely remember Tab being one of the only things I could drink without consequence. I got a onetouch mini at a pump meeting in June. The rep said that they should have new models with a download capability in the fall. Now if those would only work with the Dexcom, I'd be all set. Grr, mumble, data standards, grr.